As Halloween approaches, the number of horror movies on TV will multiply. Some will surely feature maniacal, homicidal clowns. Why is that? And why do so many of us shudder at the sight of a harmless person in face paint, a big red nose, and floppy shoes? Rest assured, psychologists have looked into the question. They tell us that clowns with a darker side actually have a long history—starting in ancient Egypt. In the early 1800s, an English entertainer named Joseph Grimaldi became a wildly popular clown. His private life was wretched, however. Family tragedy, alcoholism, and physical disability caused by his on-stage antics led to poverty and an untimely death. The famous author Charles Dickens wrote about Grimaldi, creating in the public’s eye the clown who is a manic but cheerless figure. That melancholy creation has never quite gone away. After the sad clown, like Emmitt Kelly’s “Weary Willie” in the 1930s–1950s, clown images became more sinister. Examples include the murderous clown doll in Poltergeist, Stephen King’s deadly Pennywise the Clown from It, and Heath Ledger’s portrayal of the Joker in The Dark Knight. Psychologists suggest that such negative versions are replacing positive clown images. One reason we find these characters so creepy is that they are disguised by make-up. Adults learn not to trust people who hide their true selves. But how do children feel about clowns? Scholars’ opinions differ. One psychologist observed that at about age two, children start feeling anxiety about strangers. The fact that a child can’t always separate reality from fantasy can make a clown very frightening indeed. 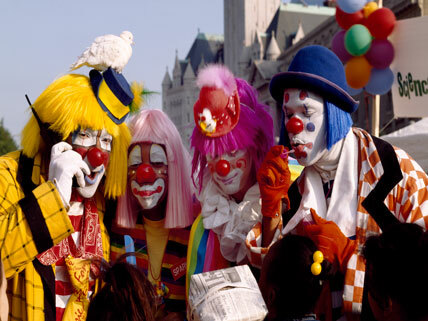 A 2008 study in England reported that a majority of kids aged four to sixteen disliked or even feared clowns. By contrast, an Italian study indicates that interacting with clowns helps reduce anxiety in children who are scheduled for minor surgery. Listen to an interview with the author of the Smithsonian article. A man dressed like the dreaded Pennywise pops up on the streets of Northampton, England, and the town freaks out. Read the interview with the clown who wants to remain anonymous. Clowns are really scary I HATE CLOWNS!!!!!!!! Okay, WHAT THE HECK IS WRONG WITH CLOWNS!? Do you want to see a magic trick?